I think one of the most important, and least understood or mentioned things in a reef tank is "mulm". That stuff that grows in the dark portions of a tank if it is set up long enough. "Mulm" is a combination of algae, sponges, bacteria, pods, worms, detritus, poop and any thing else that can be propagated or grown in the dark. I realize most people would immediately get out the sponge, razor blade or grenade to remove it but there is a word I like to use to describe those people. That word is "wrong". Mulm is a natural product that you will find in the sea all over the world. 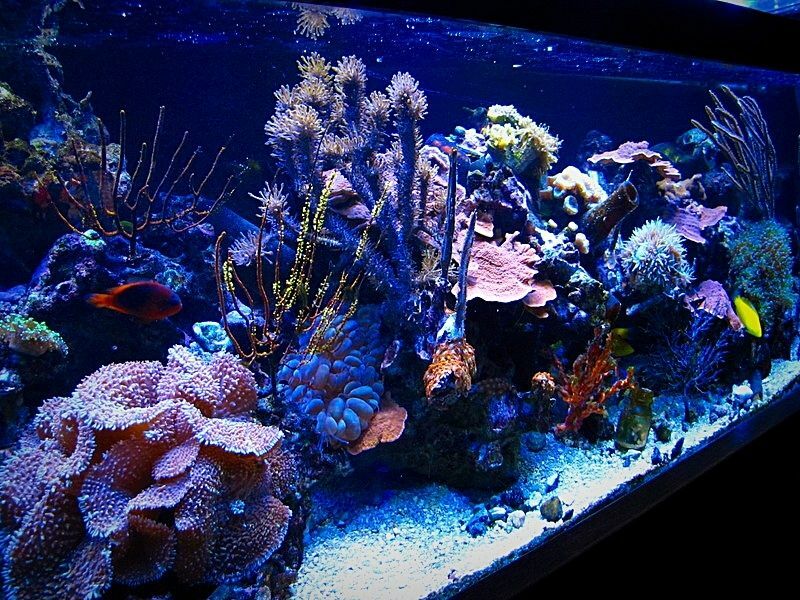 Our tanks run on bacteria, algae and a food chain. Bacteria and a food chain are dependent on having a place to reproduce. Mulm is the perfect place. Rocks and glass are flat surfaces that are only two dimensional. Mulm makes these places three dimensional allowing much more space for bacteria and microscopic organisms to grow and do the macarana. (Then love to dance) Pods, which are needed for any small fish also need to eat and their numbers are directly related to how much food they can get their hands on (or whatever pods use to eat with) The more food, the more pods, the more pods, the easier to keep smaller fish. Larger fish such as copperbands and angels also eat pods. 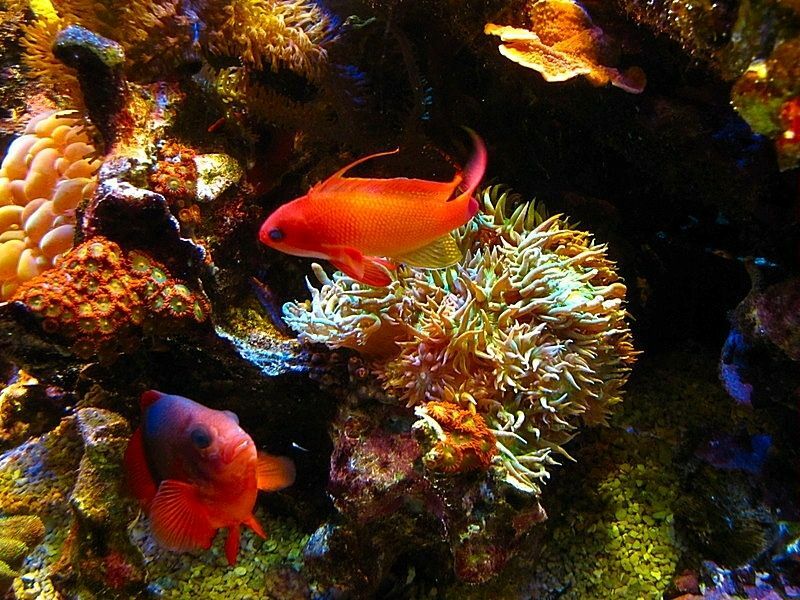 Many people try to keep fish such as pipefish, mandarins or other dragonettes in a sterile tank and while feeding them a couple of times a day with tiger pods or some other expensive food. Those types of fish will not live for long in such a tank and they certainly won't spawn which I consider the "only" criteria to determine the state of health for any paired fish. Mulm (after a while, maybe a few years) should grow on the back and sides of glass as well as under rocks. 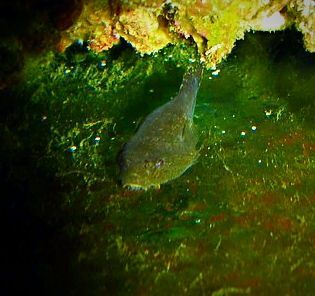 Here in this picture of my clingfish, the mulm appears green. It is really brownish and that fish is on the side of my tank. 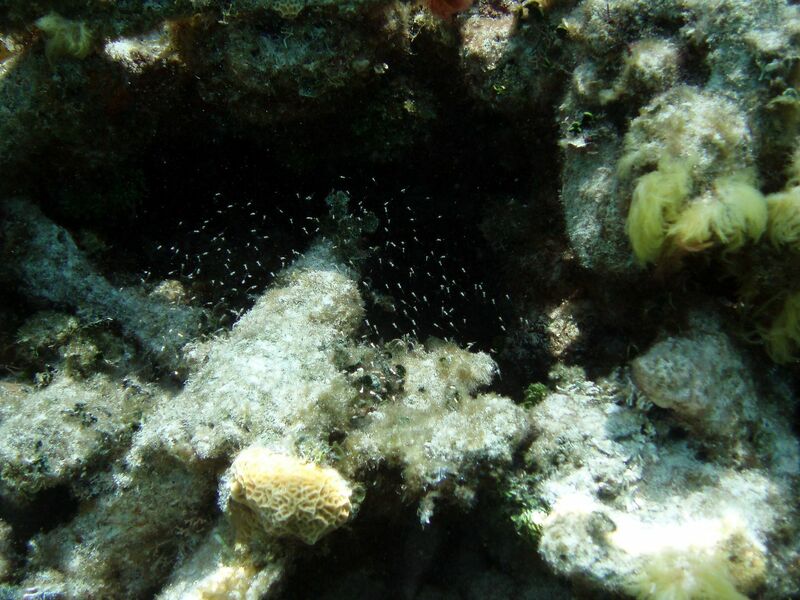 I brightened up the picture and turned it sideways because it was in the dark and the fish was hard to see. There is a thick layer of it on the back of my tank where my mandarins and pipefish like to hunt. My long spined urchin also grazes there most of the time as there is not much algae in my tank for him to eat. He is many years old as are the mandarins and pipefish and they are dependent on this food source. A sterile tank IMO is the biggest problem we have keeping certain fish healthy. Sterile is good in an operating room but very bad in a tank. I recently took this off Kauai Hawaii. The rocks are covered in Mulm. 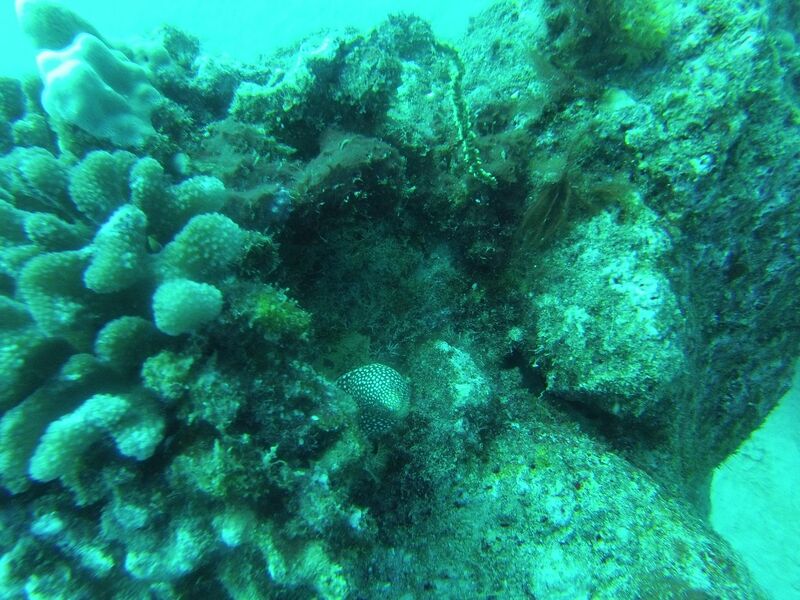 You can see a spotted moray eel in the center. This was in the Caribbean. The mulm provides food for those fry. 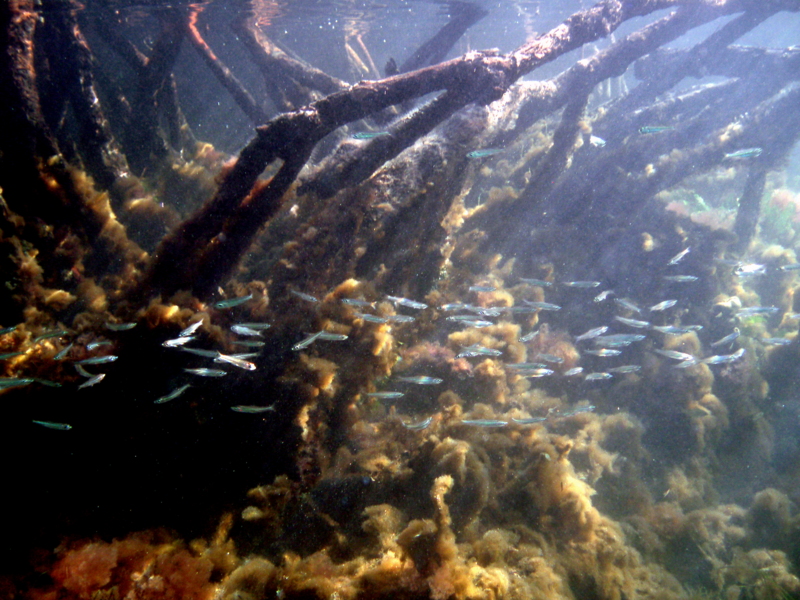 This is off a mangrove Island in Key Largo Florida. Notice the growth on the roots. I know many people will disagree with me. That is fine. But everything I propose I post pictures to back up my theories. None of my ideas come from re-hashed, inside the box rumors. I have a few places where I let detritus build up. Spaghetti worms populate these areas completely. I don't see any issues leaving detritus in the system except for it getting stirred up and causing nutrient spikes as well as falling on corals in lower flow areas after its stirred up. I siphon all the areas where it builds and has a chance of getting stirred up and releasing nutrients. The main reason I don't take it all out is its a pain to reach all the places and I am lazy. Some people say settled detritus releases nutrients even when not stirred but I don't think it does much, especially if it's in a mature system where other animals populate the detritus. Thank you LCDRDATA and Piper27. I am considering detritus and mulm as two different things and not to be confused with each other although I am sure there is detritus in mulm and mulm in detritus. There is virtually no detritus "visible" in my tank no matter how hard you look. I use a reverse undergravel filter and all the detritus in down there doing what it is supposed to do which in my tank is to slow down the water flow between the gravel. So in "My" system, I want some detritus. Don't see any detritus, but it is there. I call it detritus because it is mainly fish poop that has bound to things like algae, bacteria, sponges, worms and other animals that live there. It's clumped together so well I can scoop it out with a net without it breaking apart and floating around causing nutrient issues. It takes a good bit of time for it to form from what I have noticed. I never thought what to call it so I always called it detritus. I leave it. But just detritus laying in low flow I try and pull once it makes a layer. Yes it is. Just about anything organic in a tank can be considered mulm. Detritus is mulm but I am quantifying this mulm as the stuff that kind of grows on the sides of the tank and under rocks. The detritus that blows around in a tank is also detritus but I am separating the two of them. I am talking about the stuff that stays put and is in a thick layer stuck to something. It is stuck because bacteria, algae and fungi have been working on it to use it's nutrients as a food source. Detritus (Day-Try-Us hear)(also known as Mulm) is the decaying organic matter from decomposing dead plants or animals lying on the substrate in your tank. This material is a very important source of nutrients for tiny creatures like infusoria which some fry species require to eat at first. Usually detritus will accumulate in low water flow areas, sumps, edges of rocks, ornaments, etc. Bacteria and fungi will eventually break down detritus into its chemical components and plants will feed upon this rich source. So planted aquarums rarely remove detritus.